As Valentine’s Day approaches, many couples will be sharing dinner, a night at the movies, or some other form of a romantic evening. However, we were curious about the idea of sharing something a little different: a mortgage loan. We pulled some data from Marksman to compare co-borrowers and single borrowers, to see if there was an advantage to having a second borrower on a loan, or if it’s better to fly solo. Looking at the compiled data, the answer seems pretty obvious: co-borrowing appears to be the way to go in most cases. Co-borrowers had a higher average FICO than single borrowers, and typically had a higher purchase price than those taking out a loan on their own. 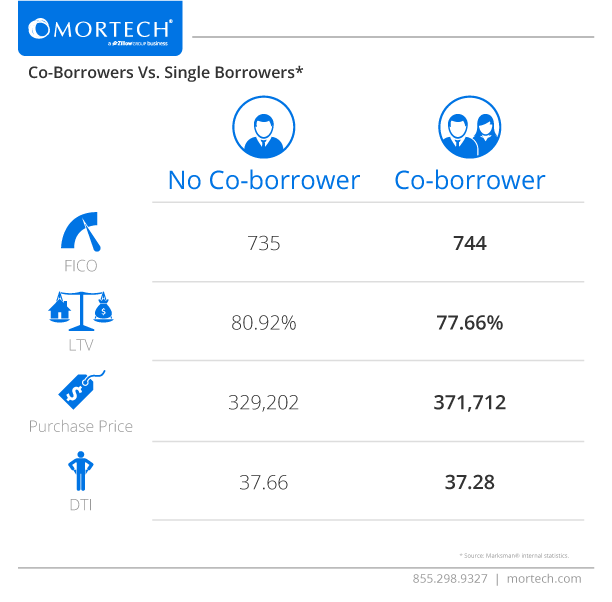 Co-borrowers also had a lower average LTV and DTI, making for a clean-sweep of advantages over single borrowers. Of course, there can be drawbacks to co-borrowing as well. Putting someone else’s name on a loan surrenders complete control over decisions made regarding the loan, and some borrowers might not want to lose that control. Others might want to co-borrow, but don’t have an advantageous FICO score, so that the average score between the two borrowers would drop substantially. So, while co-borrowing is shown to have its advantages, they aren’t so vast that a lender borrowing on their own isn’t an option either. If a borrower is on the fence about co-borrowing, though, it might be a good idea to show them the advantages they could have from doing so. Whether co-borrowing, or borrowing on their own, all prospective borrowers want instant and accurate rates available when they need them. Find out today how Mortech can supply your mortgage rates to millions of potential borrowers online, helping you reach a much wider audience.